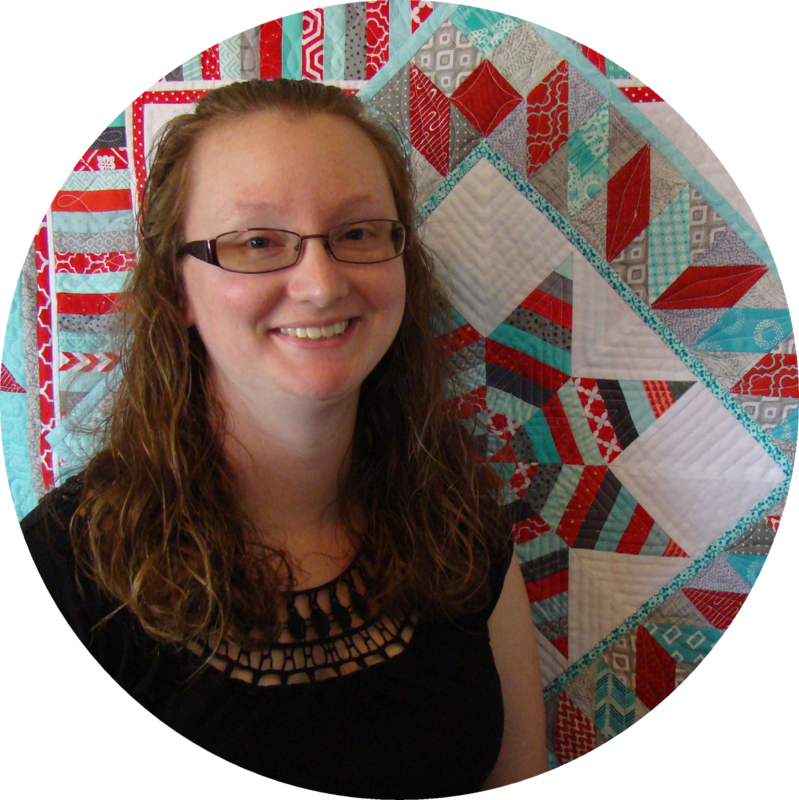 Amy Elllis of Amy's Creative Side is hosting the Blogger's Quilt Festival this month. 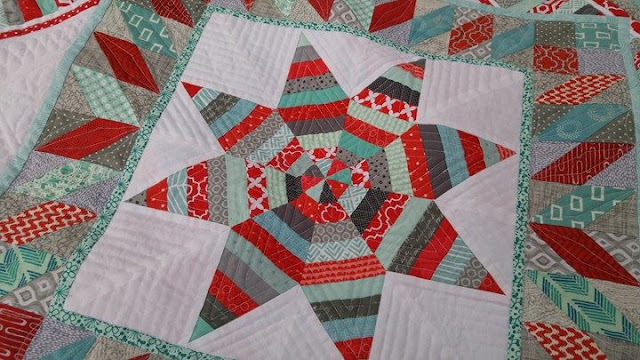 Quilters can enter up to two quilts in the various categories. 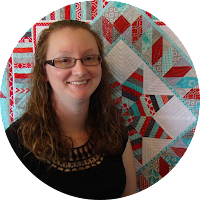 It's a great way to meet some new bloggers and see what others have been up to in the quilting world! 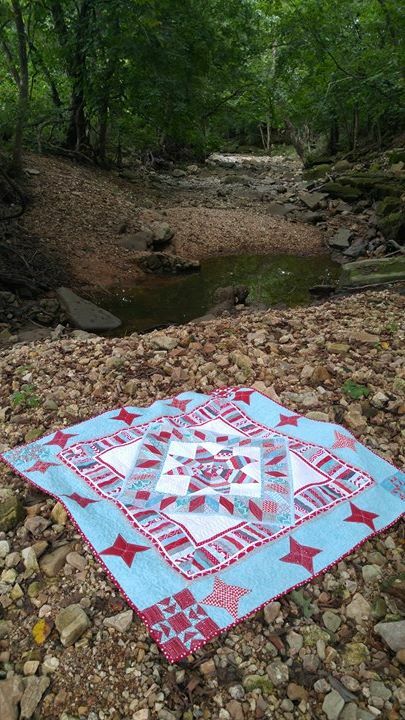 My first entry is my Round Robin quilt. 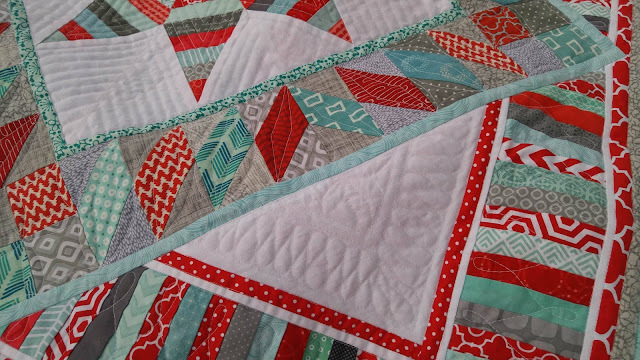 It was difficult to decide which category to pick to enter it in, but I finally chose the small quilt category. 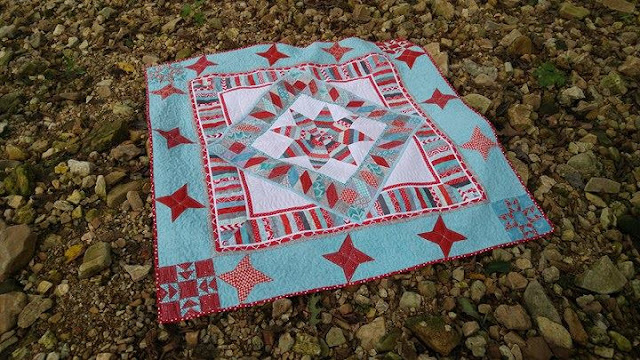 The Round Robin quilt was a project between me and my best quilty friend (BQF), Heather. I made the center string pieced block, then I mailed it to Heather. She added a border and then mailed it back. I added the next border, and mailed it back to her. We did four rounds before calling it finished. You can look back on the process by seeing my blog posts along the way. 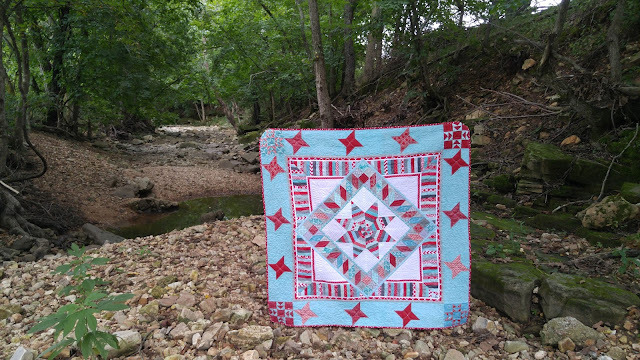 I absolutely loved the process behind this quilt! I loved the suspense of seeing what Heather added each time, but I also loved the challenge of coming up with what to add. 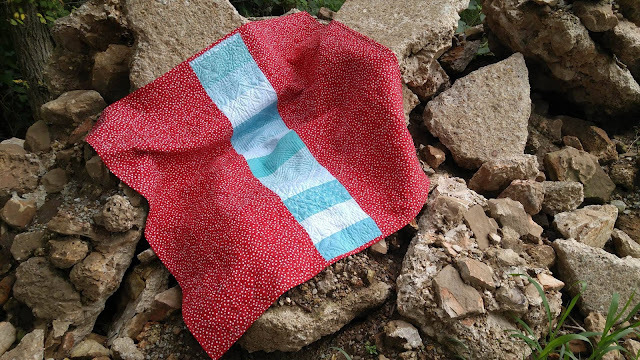 I quilted it on my own sewing machine (a vintage Bernina 930 Record). I actually surprised myself with how well the quilting turned out! It's amazing what a little practice can do! The finished quilt is 48" square. 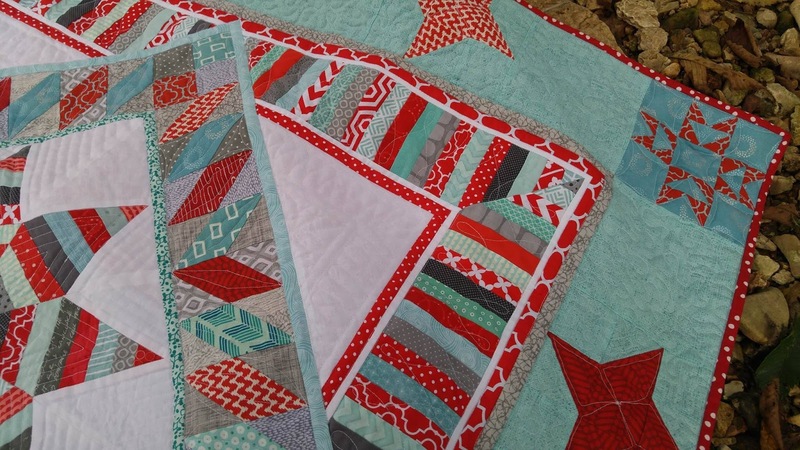 It is a mix of fabric brands, but is made with quilting cottons. It is various reds, aquas, grays, and solid white. I used a low-loft polyester batting. 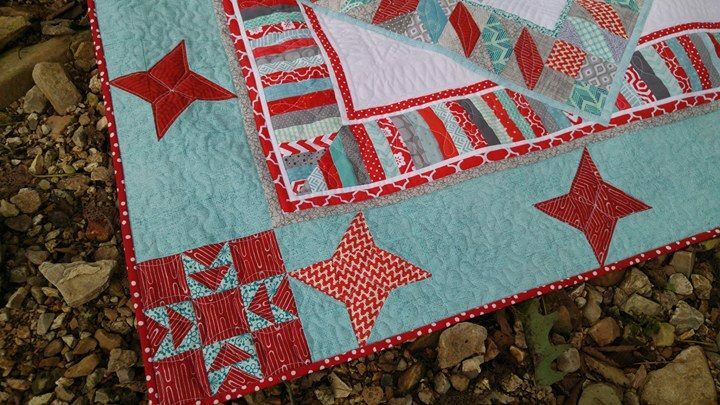 The back is pieced with some aqua scraps and a red and white dot that I also used for the binding. You can see my second entry in the Festival here. Thank you! I love discovering new bloggers too! The BQF is like a virtual quilt show! I love it! This is so lovely and the colors are so fun! Thank you! I'm a little obsessed with aqua and red! I love your entry, but the words and the fab settings for your photos are what makes it so special, after all, most of us can sew, and quilt, but to tell it in your own words, that is what I would look for, if I were a judge, and then I would put the added values on. I am going to hop to your other entry. I am in the small quilts too, with Walter's Compass.